Everything the conductor Sir Simon Rattle touches "turns to gold". Everything except for the music dramas of Richard Wagner, that is! It has often been asserted, albeit without good reason, that Rattle and Wagner do not go together. This has now been conclusively disproved by the third collaboration between Rattle and the Symphonieorchester des Bayerischen Rundfunks, together with a team of the very best Wagner singers. The general consensus over the past few years among music critics and the public at large is that everything the conductor Sir Simon Rattle touches “turns to gold”. Everything with the exception of the music dramas of Richard Wagner, that is! The oft-repeated assertion here is that Rattle and Wagner do not go together, even though no good reasons have been furnished to support this. The third collaboration between Rattle and the Symphonieorchester des Bayerischen Rundfunks, together with a team of the very best Wagner singers, now conclusively proves the opposite. This concert performance of “Das Rheingold”, the first opera in Wagner’s mighty tetralogy “The Ring of the Nibelung”, was performed live in the Herkulessaal of the Munich Residenz on April 24 and 25, 2015, and has now been brought out by BR KLASSIK on two CDs only a few months after the event. 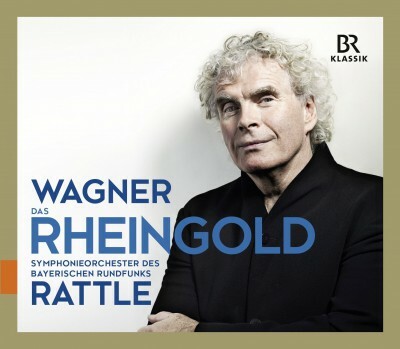 No question about it: Rattle is a master of the Rheingold score, which is certainly a tricky one due to its closely interwoven ensemble of soloists and to the fact that the orchestra does not accompany events and flow round them in a lofty manner, as in other Wagnerian music dramas, but is also sometimes quite openly rebellious! Rattle has already impressively proven his expertise at handling the music of Wagner on two occasions: in 2004 in London, together with the Orchestra of the Age of Enlightenment, and in 2006 in Berlin with the Berlin Philharmonic. The fact that he is more inclined to conduct this “evil conversation piece, almost a black comedy” (as Robert Braunmüller described “Das Rheingold” in the Munich “Abendzeitung”) with light and sometimes even dance-like inflections, and that he has the orchestra play with a great deal of colour and detail, shakes a little of the supercilious Wagnerian dust from this work, without in any way compromising the glittering brilliance of the musical sound. The soloists – all of them very good without exception – blend in completely with Rattle’s fine interpretation, which is very much in the spirit of the drama. Audiences and critics alike were unanimously delighted by the Munich concert performances. Even more than in the small Herkulessaal, which already enabled more intimate insights into the structures of the score and of the aesthetic created by Rattle, this listening experience on CD makes it clear “just how radically the avant-garde artist Richard Wagner composed in every single bar” (Reinhard J. Brembeck, “Sueddeutsche Zeitung”).